Just recently Facebook announced that it has crossed 2 billion active users. During the last year, the company grew with more than 250 million new users. Those numbers are more than the users of any other social networking platform currently available. Recent data shows that the US, once a key market for Facebook, is no longer in the lead for the most active users on Facebook. It has now been overtaken by India with 241 million users, 1 million more than US’s 240 million users. Both countries have seen tremendous growth in Facebook users in the year 2017. Active users increased by 27% in the last 6 months in India compared to 12% in the US. The major increase in users from India was partly thanks to the new Facebook Lite app being introduced which runs on lower end smartphones, ensuring that more people use it. How Does Pakistan Stack Up? Meanwhile, Facebook users in Pakistan crossed the 25 million Facebook user mark last year. Out of these 25 million, 15-20 million users are men and the remaining 5-10 million are women. 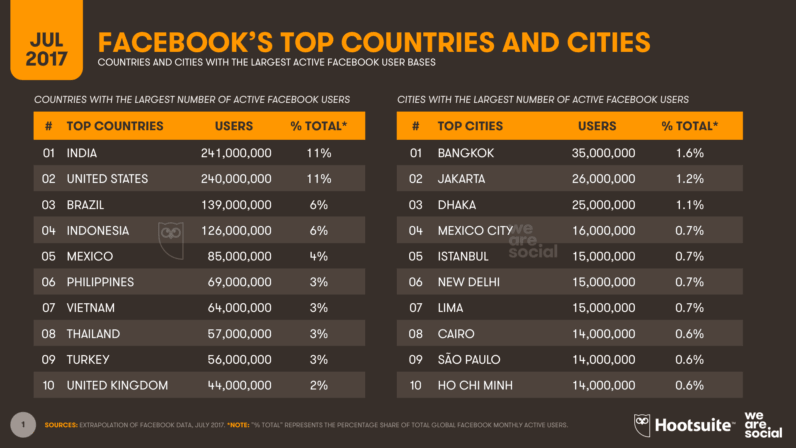 Lahore tops the charts with the maximum number of Facebook users in the country, coming in at approximately 5.2 million users. Having a population of 194 million people, Pakistan has an impressive 140 million people with mobile subscriptions. According to a report by Hootsuite, Pakistan now has 35.1 million internet users out of which active social media users stand at 31 million. The use of mobile devices is up by 13% while the use of desktop and laptop computers is down by 27%. Umm nothing to do with population, i heard India has some a few more people? no? To India Vs Pak Match Main Sub Se Aghe Pakistan Kaise Hota hai Facebook Pe ??? Mark Zinger Burger Ne Yahi Kaha tha ? Great to hear there are less Pakistani users on facebook. ? ?